Gain insight on your FreeBSD server performance and stay on top of outages. Monitor critical metrics including CPU, disk, memory utilization. Now gather data critical to analyze the performance of your FreeBSD server in a single dashboard. With our heat map, you can get a quick view of your server performance and status over the last seven days. Get microscopic visibility into every parameter including memory breakup, system uptime, and the trouble history of your server. Clicking on the desired metric opens up a detailed synopsis in a new window, which can be sent as an email or exported as a PDF/CSV file. Get real-time stats on processes and network traffic. Keep a close eye on the input/output traffic and bandwidth utilization, in addition to gaining information on data and packets sent/received, error packets, and speed of the network interface. Stay informed about any change in the URL, port, and syslogs. Using our resource checks, obtain deep visibility into every resource available on your server. Be notified when a particular check fails by setting keywords, severity, and facility levels. Out-of-the-box performance graphs and reports. Use our extensive reports to study the performance of your servers and our customizable graphs to compare metrics your way. Download and install the FreeBSD agent. A root or a non root user can install the agent. The agent will collect metrics including CPU, memory, and disk usage. This can be viewed in easy to understand performance graphs. Set thresholds and receive instant alerts during outages. 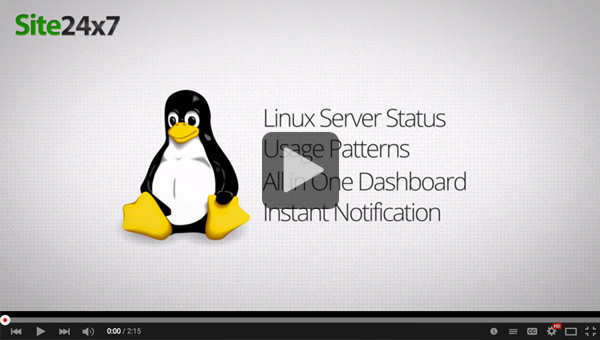 Watch video: Linux server monitoring in action.